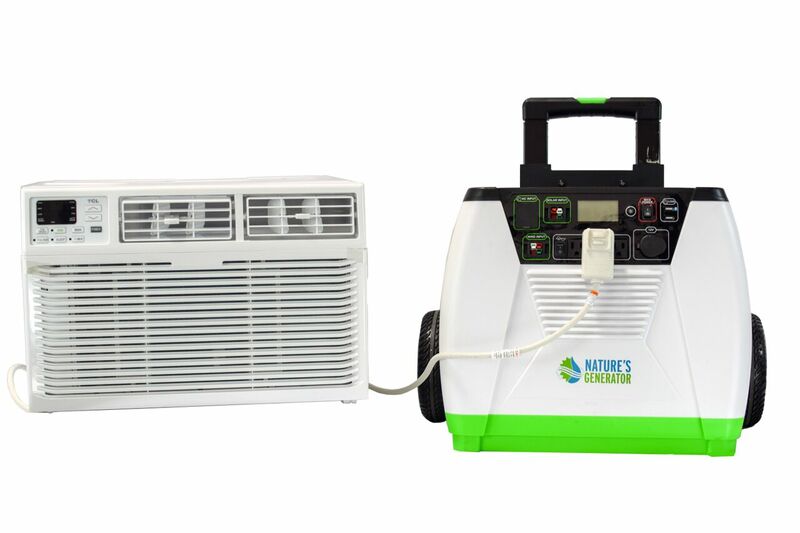 Can a Nature's Generator System help run your portable wall AC? As we get well into summer, we’re finding that more and more of our customers are inquiring about whether the Nature’s Generator is suitable to run a 6,0000 BTU window air conditioner. The immediate answer is yes. Most of these types of air conditioners require a continuous draw that is acceptable to the Nature’s Generator built-in 1800W inverter. The tough part of the question was determining how long the Nature’s Generator could power a 6,000 BTU air conditioner. One Nature’s Generator alone can power a 6,000 BTU Window Air Conditioner for about 30-45minutes on a single charge. Not a long time but keep in mind that any product requiring a substantial amount of wattage to run continuously will deplete your system charge at a faster rate. Because a 6,000 BTU Window Air Conditioner is a product that requires a large draw to run continuously, to ensure a longer run time, we had to expand the Nature’s Generator system setup. By using Nature’s Generator Power Pods and Nature’s Generator Power Panels we were able to determine that you would have approximately 16 hours of total run time if you were to use our Nature’s Generator Window AC Package. 1. What window AC unit was used to determine the 16 hour run time? We used a TCL 6,000 BTU WINDOW AIR CONDITIONER. This particular window air conditioner draws about 500W to run continuously. 2. What temperature setting was the window AC unit set to that rendered the 16-hour run time? During our test, the window AC unit used was set to its coldest setting of 68⁰ and left running continuously. Keep in mind that not everyone will run their window AC at 68 degrees continuously, but if you do, a 16-hour run time is a good approximation of your total run time on a single charge. It is also safe to say that if you run your AC unit on AUTO or fan your run time will most likely be extended. 3. Will I get a 16 hour run time without having to recharge the Nature’s Generator system? The Nature’s Generator Window AC Package will provide 16 hours of run time for a 6000 BTU Window AC on a single charge. After the 16-hour run time it will be critical for you to recharge your system. 4. What happens if I leave the included solar panels connected to the Nature’s Generator and Nature’s Generator Power Pods? If you leave the included 12 Nature’s Generator Power Panels connected to the Nature’s Generator and Nature’s Generator Power Pods you will essentially extend your run time past the estimated 16-hours. 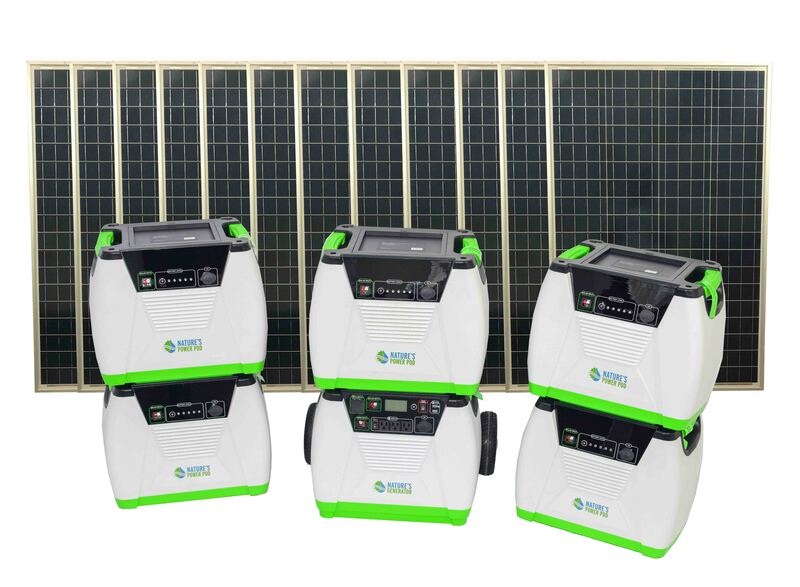 By leaving the solar panels connected, you allow your system to take in a charge at the same time it is being used. 5. How long will the 12 Nature’s Generator Power Panels take to recharge the Nature’s Generator and 5 Nature’s Generator Power Pods? If you fully deplete the charge on the Nature’s Generator and Nature’s Generator Power Pods, it will take about 10-15 hours to recharge the Nature’s Generator and Nature’s Generator Power Pods using the 12 included Nature’s Generator Power Panels.